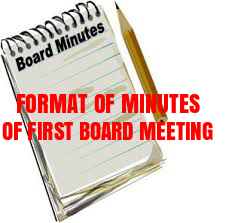 MINUTES OF FIRST MEETING OF THE BOARD OF DIRECTORS OF ___________ LIMITED/PRIVATE LIMITED HELD ON _______ THE ___ DAY OF ______, 201_ FROM ______ AM/PM TO ____ AM/PM AT _________________. The Board considered the requirement to appoint Chairman of the Board to conduct the proceeding of the Board Meetings of the Company. [Name of the Director] Director proposed name of [Name of the Proposed Chairman]and [Name of the Director], Director seconded the same and following resolution was passed by the Board. Thereafter [Name of the director appointed as Chairman] took the Chair and presided over the meeting. The Chairman commenced the meeting and extended welcome to all the Directors and Special invitees present at the Meeting. Leave of absence was granted to [Name of the Director(s)] who informed his /her/ their inability to attend the meeting due to pre-occupation. All the directors were present in the meeting. The Certificate of Incorporation No. [CIN Number] dated [Date of Incorporation] and a copy of Memorandum and Articles of Association registered with the Registrar of Companies [Jurisdiction] were placed before the Board. The Board noted the same. A copy of the approved Memorandum and Article of Association of the Company as registered with Registrar of Companies, [Jurisdiction], was placed before the Board. The Board took note of the same. A copy of Form No. INC-22 relating to the Registered Office of the Company filed with the Registrar of Companies, [Jurisdiction], was placed before the Board. The Board noted that the registered office of the Company is situated at [Address of Registered office]. The Chairman apprised that as per Section 12 of the Companies Act, 2013, a name plate containing Company’s name and address of the Registered Office be affixed at the registered office and outside of every office or place in which its business is carried on, and that the Company’s name and address of the Registered Office be mentioned in legible characters in all business letters, bill heads and letter papers and in all its notice and other official publications, etc. The Board was informed that the persons named in Article [Article Number] of the Articles of Association of the Company, as Directors, were appointed as the First Directors of the Company. The Board considered the need to authorize the Directors/officers of the Company for various filings under the Companies Act and passed the following resolution unanimously. “RESOLVED THAT [Name of the person(s) authorized] of the Company be and is hereby authorized to sign and submit various forms, returns, documents, papers, letters, undertakings, clarifications etc. 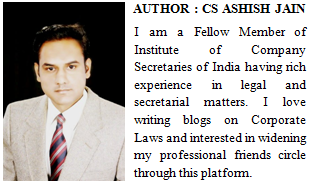 as may be required to be submitted in connection with the Company under the provisions of the Companies Act 1956/2013 as applicable or other enactments and Rules made thereunder as amended from time to time, with the Registrar of Companies, Ministry of Corporate Affairs and other Government Authorities and to do all such acts, deeds, matters and things as may be required in this regard in the manner as thought fit and in the best interest of the Company. RESOLVED FURTHER THAT [Name of the person(s) authorized] of the Company, be and is hereby authorized to appear before ROC, MCA or any other government authority, statutory body, establishment etc. in connection with the aforesaid matters. The Chairman informed the board that the Company has received general notice of disclosure of interest in Form MBP-1 from [Name of First Directors], First Directors of the Company, under Section 184 of the Companies Act, 2013. “RESOLVED THAT pursuant to the provisions of Section 184 of the Companies Act 2013 (as amended or re-enacted from time to time) read with rule 9 of the Companies (Meeting of Board and its Powers) Rules, 2014, the disclosure of interest in Form MBP-1 as submitted by [Name of First Directors], Directors of the Company and read out at this meeting be and are hereby taken on record. The Chairman informed the board that the Company has received confirmations in Form DIR-8 from [Name of First Directors], First Directors of the Company. The Board noted that none of the Directors were disqualified as per the provisions of Companies Act, 2013. "RESOLVED THAT confirmations in Form DIR-8 under section 164(2) of the Company Act 2013 as submitted by [Name of First Directors], Directors of the Company, be and are hereby taken on record”. The Chairman placed before the Board the facsimile of Common Seal of the Company for its approval. The Board discussed the matter and passed the following resolution unanimously. 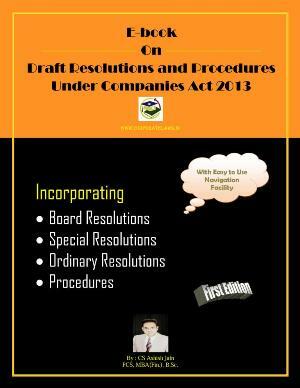 The Chairman apprised the Board that pursuant to the provisions of Section 139(6) and other applicable provisions, if any, of the Companies Act, 2013, (including any statutory modification(s) or re-enactment thereof for the time being in force), a Company is required to appoint the First Auditors within one month of the date of registration of the Company. “RESOLVED THAT pursuant to the provisions of the Section 139 and other provisions applicable, if any, of the Companies Act, 2013, read with Companies (Audit and Auditors) Rules, 2014, [Name of Statutory Auditors],Chartered Accountants, having FRN No. [Firm Registration No] based at [Address of Statutory Auditors] from whom a written consent to act as first Auditor along with certificate pursuant to section 139(1) of the Companies Act, 2013, has been received, be and are hereby appointed as the first auditors of the Company to hold office until the conclusion of the first Annual General Meeting of the Company at such remuneration as may be agreed between the Board and the said Auditors. It was informed that the company has received share application money from the subscribers. No. of Equity Shares of Rs. __ each. “RESOLVED THAT a Current Bank Account of the Company be opened with [Name of the Bank] at [Branch Address] (“the said Bank”). RESOLVED FURTHER THAT the above mentioned signatories be and are hereby authorized to sign and execute all such papers, documents, deeds, agreements, undertakings, declarations, acknowledgements, confirmation of all debts, securities etc. and to do all such acts, deeds and things as may be deemed necessary and expedient in this regard. RESOLVED FURTHER THAT if required, the Common Seal of the Company be affixed as per the Articles of Association of the Company. The Chairman placed before the Board the matter regarding payment of sitting fee to Directors for attending the meeting of the Board of Directors and its committees. The Board expressed that Company was recently incorporated and was yet to start its business. In view of same, it was proposed that no fee, traveling or such other expenses shall be paid to any Directors for attending the meeting of the Board of Directors for the time being.